Last year, Maserati used the Geneva auto show to debut its GranTurismo S with a more powerful 4.7-liter engine. However, at the time it was available only with an upgraded version of the company's manual-based electro-actuated transmission. For the 2009 Geneva show, Maserati will reveal a new ZF automatic gearbox for the 433-hp coupe. If our prior experiences with ZF automatics hold true, the six-speed unit should provide the GranTurismo S with smooth and lightning-quick shifts. 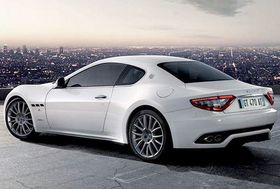 Mild visual differences distinguish the GranTurismo S automatic from other models. Under-door mini skirts and new 20-inch wheels with a trident design are special to the automatic-equipped cars. Additional new standard features include Bluetooth and an iPod interface for the interior's multimedia system.